On Divine Mercy Sunday earlier this month, a characteristically courageous Pope Francis referred to the extermination of 1.5 million Armenians by the Ottoman authorities between 1915 and 1922 as an act of genocide. 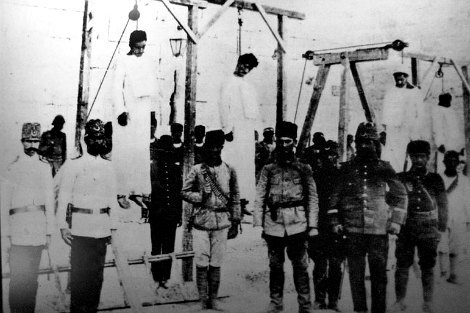 Most historians describe what happened as genocide, though Turkey hotly denies this view and there are consequences for world leaders who express it. Turkey immediately recalled its ambassador to the Vatican after the Pope’s remarks. Francis can ill afford to alienate an important ally in the resistance against radical Islam, and the same can be said for our prime minister. It was unfortunate that circumstances were such that Tony Abbott had to have a face to face meeting with his Turkish counterpart Ahmet Davutoglu on the eve of this week's centenary of the genocide. Unsurprisingly he didn’t mention the genocide. Unfortunate for him is the irony in the fact that he’s visiting Turkey to commemorate the courage of Australians 100 years ago. But in his defence, other western governments have also been too timid to risk offending Turkey. In 2001 the UK’s Tony Blair ignored a petition to recognise the genocide and tried to exclude survivors from commemorating their dead. Then in 2008, US President Barack Obama declared during his presidential campaign that 'as president, [he would] recognise the Armenian genocide’. But, like his predecessors, he became reluctant to upset an important NATO ally once he was in office. For Tony Abbott, it is no doubt a challenging and tricky quirk of fate that the centenary of the genocide takes place within a day of that of the Gallipoli landing. But it does Australia no credit if we are regarded as complicit in the wilful act of forgetting the crime against the Armenian people at a time when we are engaged in such a no holds barred recollection of what happened at Anzac Cove. Remembering the fallen Australian troops whom the British commanders used as cannon fodder, the Australians returning to Gallipoli for the centenary of the landing are themselves open to being exploited in what London Independent columnist Robert Fisk describes as a 'shameful attempt to hide the Armenian Holocaust’. Turkey is doing its best to cooperate with organisers of the Anzac commemoration on its soil because the Australian visitors are helping to 'smother memory of its own mass killing of the Armenians of the Ottoman Empire, the 20th century’s first semi-industrial holocaust’, as Fisk puts it. It is notable that the NSW Coalition Government went against the grain of timidity, and suffered the displeasure of the Turkish Government and a not insignificant number of voters of Turkish background. In 2013 it passed a unanimous motion to officially recognise the Armenian genocide, following a visit to Armenia by a multi-party parliamentary delegation. A message came through the Turkish Consul General that NSW MPs would ‘not be welcome in Turkey’ for the 2015 Gallipoli remembrance. It’s not clear what ensued, but the NSW Government’s Treasurer Gladys Berejiklian was in the Armenian capital Yerevan on Friday to attend at service marking the centenary of the genocide. Berejiklian is the granddaughter of Armenian genocide victims. Despite a significant Armenian population here, the Federal Government had said it would not send an official representative to the ceremony in Yerevan. It’s hard to underestimate the importance of the small but difficult steps of these politicians in the NSW Parliament to go out on a limb to recognise the Armenian Genocide, and not to blur or conceal the truth, as the Federal Government has done. As Pope Francis reminded the faithful at St Peter’s Basilica, 'concealing or denying evil is like allowing a wound to keep bleeding without bandaging it’. Image from Armenian Genocide Museum-Institute (Wikimedia Commons). History has taught us about turning a blind eye on genocide. Consider the words of Adolf Hitler to Nazi officers in August 1939, a week before the invasion of Poland: “Go, kill without mercy … who, after all, speaks today of the annihilation of the Armenians?” ” In 1923, journalist Hans Trobst wrote in the Nazi newspaper Heimatland, “these bloodsuckers and parasites, Greeks and Armenians, had been eradicated by the Turks.” This chilling praise of genocide foretold atrocities to come. High school textbooks in Turkey today refer to the “Armenian matter” (the word genocide is never used) and describe it as being the result of provocation by Armenians. Insinuations of genocide are said to be a lie used in an attempt to harm and break up Turkey. All in stark contrast to the German repentance and the veritable Nazi Hunter industries that tracks down and gathers information on alleged former Nazis, SS members and Nazi collaborators involved in the Holocaust, typically for use at trial on charges of war crimes and crimes against humanity. Prominent Nazi hunters include Simon Wiesenthal, Tuviah Friedman, Serge and Beate Klarsfeld, Ian Sayer, Yaron Svoray, Elliot Welles, and Efraim Zuroff. Most recently In September 2014, it was reported that Oskar Gröning[born 1921] had been charged by German prosecutors as an accessory to 300,000 murders as a consequence of his role at the Auschwitz extermination camp Lest we forget! In all that has been written about the Armenian genocide I have never read one reference to the French being even remotely involved. Until now that is, where we have it on the authority of “musa” that “the French did most of the killing.” One can almost visualise the anguish of the world’s leading scholars bemoaning their own shoddy research as they rush to rewrite the history of the Armenian genocide in light of this overwhelming new evidence. Among those who had the courage to go to Yerevan for the commemoration (from all I have read, a beautiful modern city) were Francois Hollande and Vladimir Putin. I don't know from where we are represented in Armenia - probably, Moscow - but I hope we at least had the minimal grace to send our ambassador. To their credit, Kim Kardashian, her husband and child went to Turkey and visited Armenian genocide sites. They were received in Turkey courteously by the authorities, according to news reports. Yerevan is on my bucket list to visit before I die - I want to honour these brave people. "As Pope Francis reminded the faithful at St Peter’s Basilica, 'concealing or denying evil is like allowing a wound to keep bleeding without bandaging it'. This is very true of ongoing evils, but unless the evil is continuing, or the evil-doers are profiting from it, reviving old evil deeds can instigate or perpetuate prejudices and ill-will. Guy Fawkes Day was long commemorated with no real good coming from it. The atrocities of the British against Ireland are best left in the past. What is best kept before our eyes and memories are the ideal efforts and accomplishments of heroes and heroines, so we are inspired to goodness rather than to retaliation and retribution. The former British PM, Harold Macmillan, summed up the life of a Foreign Secretary thus: Forever poised between a cliche and an indiscretion. That's still characterises foreign relations today. No wonder the warmongers (of all stripes) can go ahead and do what they like. They can trust their diplomats to say no in such a way that it sounds like yes; or ethnic cleansing so that it sounds like an anti-measles health campaign. Pity our media generally have given this so little coverage. Perhaps they lack courage too. Robert Fisk, the Independent's long term Middle East correspondent and also a long time critic of those who deny the Armenian genocide, had an interesting article in that journal last Sunday where he described witnessing a ceremony in Istanbul where several thousand, he estimated 60% Turkish, commemorated the genocide. The main speakers were Armenian and Armenians from all over the world attended. The event was not disrupted by the police nor anyone else. That same Sunday he was at a seminar at Bogazici University in Istanbul where academics from all over the world, including Turkey, discussed this genocide as the fact it was. Fisk also mentioned Vladimir Putin's recent visit to Yerevan where he publicly participated in the commemoration of the genocide and called it such. As far as I am aware there was no official Australian representative at that ceremony though Gladys Berekjiklian - a descendant of a genocide survivor - represented NSW. Joe Hockey, with a similar ancestry to Ms Berekjiklian, did not speak at a ceremony in Sydney for the same occasion. Fisk thinks Turkey will ultimately admit the genocide. This is one of those many horrible historic events that need to be acknowledged. Thanks Egward Fido but Turk machinations abound! ceremonies, condemned as ‘indecent manoeuvre’ "
Turkish official pov now acknowledges about 350,000 Armenians perished at Turkish hands. The claim is, when nationalist Armenians seeking independence attacked Turkish villages depleted because menfolk defenders engaged in a war that the Turkish govt expected to win, (with the extremely powerful German-Austro-Hungarian Empires,) that the death toll was entirely to the quelling of rebellion. It's demonstrably false, and of course it's a save-face. Many discerning Turkish people know the truth, and some of them are public in their private apology. The same situation exists in Japan. In China, I suspect that the rehabilitation of Chairman Mao to greater revered heights is at the expense of the terrible tragedies suffered by the people, and culture, due to his great experiments.